Helen Jean Compton a resident of Green Forest, Arkansas, was born October 18, 1928 in the Orrell Community in Carroll County, a daughter of Herman E. and Clara Marie (Kinney) McMorris. She departed this life Monday, April 1, 2019 in Green Forest, at the age of 90 years. Helen attended the Osage Assembly of God Church near Osage. She worked for 14 years at the Green Forest School. 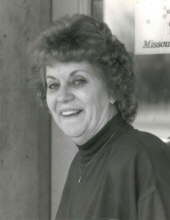 She was an avid sports fan which included cheering on the Green Forest Tigers, Berryville Bobcats, St. Louis Cardinals, and the Arkansas Razorbacks. Helen is survived by one son, David Compton and his wife Janell of Green Forest, two daughters Brenda Bishop and husband Von of Green Forest, Cheryl Hoppe and Greg Hood of Green Forest; eight grandchildren, Kendra Bell, Kristin Gordon, Brent Compton, Joy Compton, Jordan Compton, Mandy McAlister, Kamarra Buening, Donnie Hoppe III; eleven great-grandchildren, one great great-grandchild; and a host of other family, friends, and loved ones. On February 28, 1948, Helen was united in marriage with Joy Jefferson Compton, who preceded her in death. She is also preceded by her parents, Herman and Clara Marie McMorris; one sister, Faye Estes; and one infant daughter Dana Michelle. To send flowers or a remembrance gift to the family of Helen Jean Compton, please visit our Tribute Store. "Email Address" would like to share the life celebration of Helen Jean Compton. Click on the "link" to go to share a favorite memory or leave a condolence message for the family.